Climate change could cause as much damage as when the dinosaurs were wiped out by an asteroid strike – taking life ten million years to recover, scientists warned. Man’s destruction of planet means life on Earth could take equally as long to recover as it did after the “Great Dying” more than 60 million years ago. The alarming study warned recovering from mass extinction – which could potentially be caused by climate change – has a ten million year “speed limit” for ecosystems to redevelop. British and American scientists predict that the planet could dramatically look different to how it is now – just as how it is currently incomparable to what it was like for the dinosaurs. Human caused climate change such as air pollution, rising sea levels and habitat loss could trigger mass extinctions once more, they said. The recovery speed limit has been observed across the fossil record, from the “Great Dying” that wiped out nearly all ocean life 252 million years ago to the massive asteroid strike that killed all nonavian dinosaurs. Mr Fraass and US colleagues looked at the last change and they suggested that evolution could be the cause of such slow recovery, rather than environment. They studied the recovery rate of a tiny organism, planktic foraminifera which dates back to the extinction of the dinosaurs. Foram fossils are aplenty in ocean sediments which meant the researchers could closely track them without any large gaps in time. They discovered a high level of ecological complexity, such as the development of new traits to create a new species, is needed before it can fully evolve – a process that slowed down global recovery. But the researchers said the findings have alarmingly similarities to the current escalating climate crisis and increasing habitat destruction. 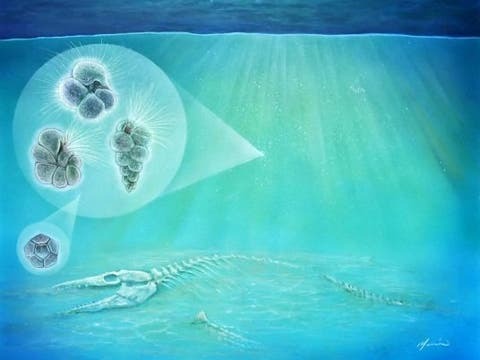 Paleoceanographer Research Associate Christopher Lowery at the University of Texas Institute for Geophysics said: “The implication should be that these same processes would be active in all other extinctions. Mr Fraas and Mr Lowery measured the foraminifera which developed 20 million years towards the end of the extinction and recovery. The study published in the journal Nature Ecology & Evolution is the first to use fossils to predict the future of our planet. The scientists plan to use the same theory, which was supported by previous research, to assess the recovery phase from late Jurassic to the present day. The recovery from past extinctions offers a road map for what might come after the modern ongoing extinction, which is driven by climate change, habitat loss, invasive species and other factors. Mr Fraass said: “We’re hoping that examining the rest of the planktic foraminiferal record will give us insight into how climate shaped their evolution. Assistant Professor Pincelli Hull at Yale University in New Haven, Connecticut, said the study sheds light on factors driving global recovery following widespread destruction. She said: “Before this study, people could have told you about the basic patterns in diversity and complexity.